OUR LIGHTEST, MOST CONVENIENT TRAVEL TRAINER! TRX's GO Suspension Trainer Kit helps you create intense full-body workouts Anytime, Anywhere! 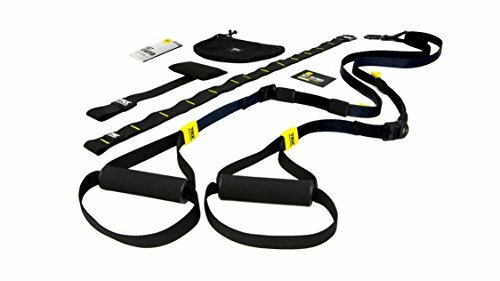 Includes Suspension Training Strap, Indoor/Outdoor Anchors, 2 Workout Guides, Training Poster & Mesh Bag-Download TRX App to Generate FREE Limitless Intensity! INCREDIBLE RESULTS IN JUST 20 MINUTES! TRX gives you the power to hit fitness goals at home and on the go. Our digital workouts teach you EASY Core Strengthening Exercises that Build Muscle, Burn Fat, Increase Endurance & Improve Flexibility-making you Train, Look & Rapidly-Feel like a Powerful Professional Athlete NOW! MOVEMENT-BASED TRAINING AT YOUR OWN PACE is TRX's Training Philosophy. Learn, Practice & Master 7 Simple Foundational Moves that everyone can do! Push, Pull, Plank, Squat, Lunge, Hinge & Rotate to Achieve Your Dream Body Fast! Then hit next-level intensity by creating limitless workout variations you CRUSH AT YOUR OWN PACE! TRAIN EVERYWHERE! TRX anchors to any door, rafter, beam, tree, pole or post in seconds that supports 350 lbs. Weighing only one pound, our GO Suspension Trainer Kit travels Light & Fast-giving you freedom to Master Our Patented Suspension Training Method in the comfort of your home or even while traveling! NEVER PAY PRICEY GYM & PERSONAL TRAINER FEES EVER AGAIN because we help you do it all! TRX's GO Suspension Trainer Kit uses NO WEIGHTS & NO OTHER SPECIALIZED FITNESS EQUIPMENT while utilizing gravity to make your entire body flex, rejuvenating how you Look, Feel & Think-GUARANTEED!